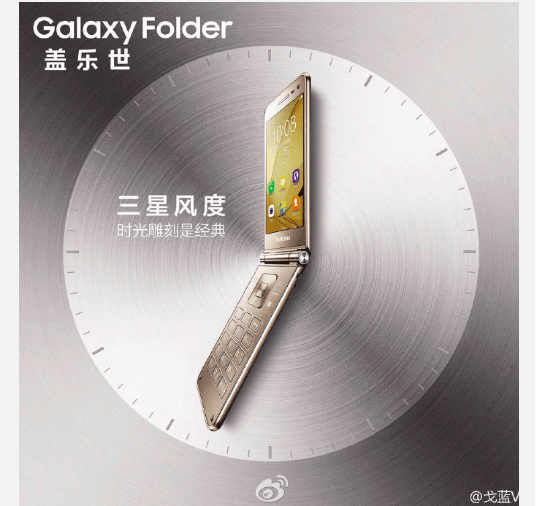 Samsung’s clamshell smartphone, dubbed as the Galaxy Folder 2 is leaked in the promotional images. The device was earlier reported to have cleared FCC and TENAA certifications. Now with the leak of the latest images, the device is expected to go official soon. In the pictures, we get to see the device in Gold colour, in a slim metal body. Regarding specifications, the Galaxy Folder 2 is tipped to come powered by a 1.4GHz quad-core Snapdragon 425 chipset. It will feature a 3.8-inch touch display with a resolution of 480×800 pixels. The device will pack 2GB of RAM with 16GB internal storage, which is expandable up to 128GB via microSD card. A 1950mAh battery backs it. It supports connectivity options such as 4G LTE, 3G, Wi-Fi, Bluetooth 4.2, GPS, and MicroUSB. Codenamed SM-G1600, the Galaxy Folder 2 is most likely to come with dual SIM support. The smartphone is expected to come with an 8-megapixel of a primary camera along with a 5-megapixel selfie camera. It measures 122 x 60.2 x 15.5mm and weighs 155 grammes. It runs Android 6.0 Marshmallow out of the box. Samsung coming up with a clamshell smartphone is pretty surprising, though. The recent clamshell phone that we witnessed this year was by Gionee – the W909. It would be interesting to see how buyers respond to this device by Samsung. Stay tuned with us for more on Samsung Galaxy Folder 2. ChampOne C1 launched for Rs. 501 with 4G and fingerprint scanner; Another Freedom 251? I din like. Waiting for Moto Razr Android with better specs than this. Who will wanna use this old t9 keypad. They should’ve gone for qwerty physical it would’ve rocked.